Recreational and subsistence bottomfishing are rare. The fishing technology is relatively unsophisticated. The fishermen typically jig on day or overnight trips using fresh or frozen bait such as skipjack tuna. Most vessels are aluminum alia (pronounced ah-lee-ahs) catamarans less than 32 feet in length, outfitted with outboard engines and wooden hand reels that are used for both trolling and bottomfish fishing. Because few boats carry ice, they typically fish within 20 miles of shore. In recent years, a growing number of fishermen have been acquiring larger (> 35 ft) vessels with capacity for chilling or freezing fish and a much greater fishing range. Major constraints to this fishery have been devastating impacts from hurricanes, with most recent being Heta in January 2004. Other factors have included the development of the local longline fishery, escalating fuel prices and increasing imports from the independent state of Samoa. Spiny lobster (Panulirus penicillatus) is the main species speared by night near the outer slope by free divers while diving for finfish. Lobsters remain one of the more expensive reef species taken and are often present in important meals such as wedding, funerals, Christmas and New Year’s Day. Formerly, lobsters were provided at the level of the village or family. Nowadays, they are mainly bought at the market, caught by a professional fishermen. The reef fish catch composition in American Samoa is dominated by six families: Acanthuridae (28 percent), Serranidae (12 percent), Holocentridae (12 percent), Lutjanidae (7 percent), Mugilidae (7 percent), and Scaridae (6 percent). Atule (Selar crumenophthalmus), a coastal pelagic species, seasonally accounts for significant portion of the coral reef catch. Low catch years associated with hurricanes may be the result of fleet damage or fishermen being occupied with other work. A decline in commercial reef fish catches after 1997 may have resulted from increased enforcement of commercial license requirements between 1997 and 2000. 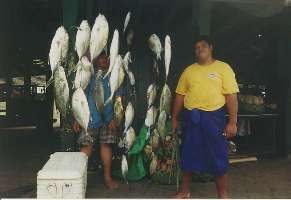 In 2001, the American Samoa Department of Marine and Water Resources prohibited the use of scuba gear while fishing to help reduce fishing pressure on the reefs.